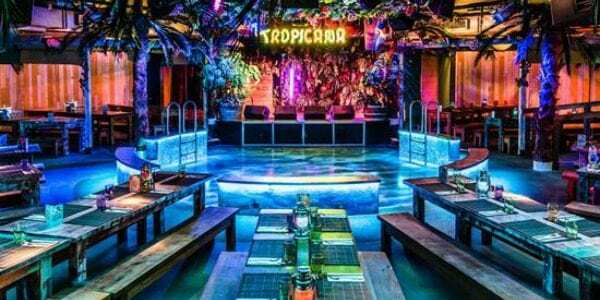 Tropicana Beach Club is the newest venue in London, launched just for few lucky guests at the end of the 2016. The club will be available for guestlist and table booking from the beginning of the 2017. 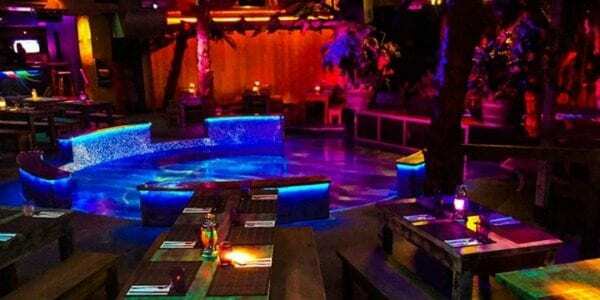 This nightclub and restaurant will be the most talked of the New Year. Reserve early your party with us at Tropicana Beach Club to avoid to be on waiting list. 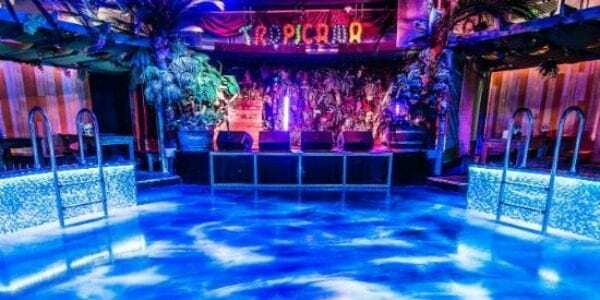 Due to its central location in Covent Garden and easy accessibility form the Tube Station, Tropicana beach Club guestlist will be the busiest in London on weekend. The club has a unique layout. It presents a central swimming pool-like dance floor surrounded by tables. Step into Tropicana Beach Club and experience a trip to paradise. You do not need to step foot out of London. Features of Tropicana Beach Club are a ‘lagoon pool’ style dance floor surrounded by VIP beach cabanas, two bars set up and party booths. The design features 30ft palm trees, over 500 tropical bird decorations and a jungle of exotic flowers and plants. Since Tropicana Beach Club hosts group sizes of up to 600, it the biggest club in London alongside Café de Paris. Tropicana guestlist is a fun filled destination for anyone looking for a little escape from the hustle and bustle of London. The night concept is: after guests ‘check in’ they are invited to enter ‘full on holiday mode’. Finally, by joining Tropicana guestlist you enjoy live music, cabaret style acts and Caribbean style steel drums. Also, beach style games such as coconut shy and surfboard limbo take place, all hosted by a team of lifeguards. Tropicana Beach Club boasts a new installed technology. This allow to manage of ambiance and sound creating sunset, sunrise and twilight scenes. Finally, watch out tropical thunderstorms. Alongside a ‘treasure cove’ of rums stock, Tropicana Beach Club offers also over 50 cocktails from classics to new creations. Already famous cocktail is the bar’s signature ‘Flamingo Fling’. Party groups can enjoy amazing sharing drinks vessels. Those includes a luxurious 3ft long yacht, palm tree and giant Pina Colada. Tropicana Beach Club proud itself to serve an amazing food menu. Chef Trevor Tobin (Steam and Rye, Big Easy and Burger and Lobster) runs the kitchen. It takes inspiration from beach style grills from across the southern globe. There is a blue lagoon. Don’t worry, you won’t be getting your feet wet. The centre of the club features a digitally enhanced, interactive dance floor, on which you’ll be avoiding (virtual) sharks. Also, you will be attending in (actual) shot-laden surfboard limbo contests, amidst the occasional tropical thunderstorm. It is cocktail time. You’ll definitely know when it comes. Because sparklers will be blazing, Copacabana will be blaring and the lifeguard staff will be running over to your table. They will bring sharer cocktails served in anything from coconut-laden palm trees to actual miniature yachts. Of course, if you’re more of a tropical wallflower, you can prop up either of the two bars enjoying one of their 50+ individual cocktails. A summer’s tune. Some of the live acts on offer includes an elemental magician steel, drum bands, cabaret and fire shows. It’s something to do with whipping ice, sand and fire out of a sleeve. Also, it’s a club. Hence, there will be dancing. Hosting days at Tropicana Beach Club. Our team has started working at Tropicana Beach Club since the beginning of 2017. We provide guestlist and tables service from Thursday to Saturday. By joining our Tropicana guestlist we offer to our guests few free cocktails. This venue is one the best to celebrate your birthday Party. Our Birthday Package deal applies here. We can sort out special packages including food. Inquire us for your Birthday Party. To best enjoy your party at Tropicana Beach Club booking a private table. We will quote table minimum spend cost to each group. Please use the “Table Booking” form on this page. Also, specify how many guys and girls are coming with you. We will send you back a quote. Tropicana Beach Club is available also for private hire for up to 600 guests. If your group is up to 200 guests, the venue is available for semi private hire. Two areas with individual bars will be available, the Lagoon Bar and Rum Reef Bay. For smaller bookings of 6 to 50, beach cabanas are available to hire with varying sizes. Also, the beach cabanas can be customized and offer views of the stage, table service and privacy if desired. What we think about Tropicana Beach Club. We are really excited to start working with Tropicana Beach Club. Due to what we have seen so far, do expect one of the best guestlist at Tropicana Beach Club. So, to access the venue guestlist is mandatory. Therefore, inquire us for Tropicana guestlist. Once at the club, you need to provide proof of identity. Dress-code is also very important.